I had a curious thought today as I passed by Mom looking happy and content sitting in the dining area with the other residents. The thought came to me I wonder if Alzheimer's disease has allowed her to lower her guard letting her be the person she might have been if life had not thrown her some curve balls. I believe Lily was a happy carefree child spoiled by elderly parents as the baby of the family growing up in Ireland. She was often told she looked like Shirley Temple with her curly red hair, blue eyes, and I have to believe a charming, mischievous personality. I often look at my own son and wonder if Lily was like him because he is similar to her in many ways. I know as a young girl Mom loved going out with her friends to dance halls and loved having fun and laughing. From the best I can tell I do not think she took life too seriously or gave it much thought. When the opportunity presented to come to America where the streets were paved with gold she jumped on it which showed to me that she had courage and optimism among her character traits. I believe her fun loving personality prevailed through marriage and kids enjoying coffee chats with the ladies of the neighborhood. She was definitely the social half of the marriage as my father was an introvert with the stereotypical engineering personality. Life was good until 1965 when my father committed suicide leaving his bride with 3 children, ages eight, seven, and one. Lily's life was turned upside down and so I believe was her personality. 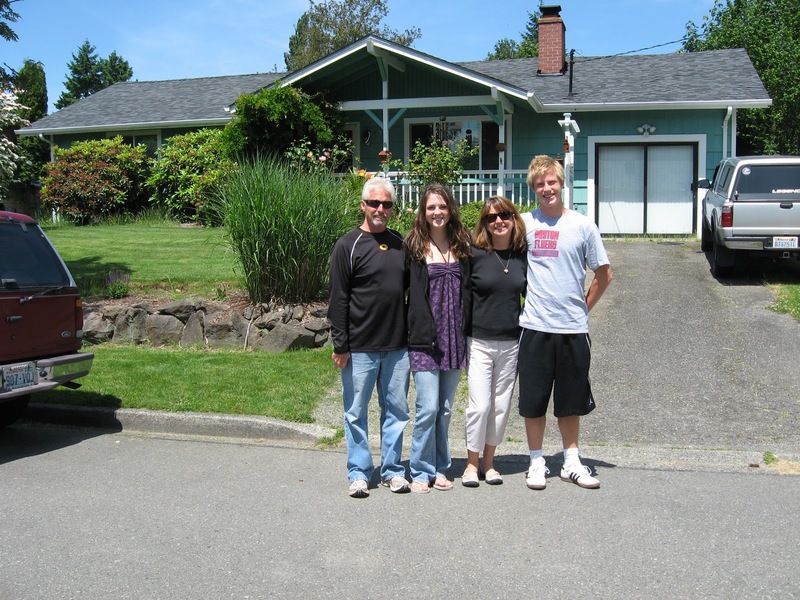 My family in 2010 in front of the house in Seattle where we lived when my father died. which also has 3 levels behind the house. From this carefree fun loving girl full of life and optimism to a widow with all that entails in a blink of an eye. Her life changed. Besides obvious devastating grief came shame and embarrassment. Lily's inclination was to flee and she did quickly selling her house and moving us to Ohio where nobody but her sister knew the real story. Not even my brother and I knew being told my father died of a heart attack. With the move the walls went up guarding ever so closely this horrible shameful secret of a husband who did not love his wife or family enough to hang in there. No longer was Mom the same nor ever would be. Forever more she kept friends and family at arms length. She became bitter, pessimistic, and negative. I don't remember ever being kissed or hugged by my mother. As you can imagine life in our household was not a happy affair. We all just trudged on going through the motions. Eventually, of course, the children forged their own paths and Mom stayed on course until she moved to SC at my sister's urging who lived there. That was ten years prior to her diagnosis and probably six years before she started showing noticeable symptoms. In SC I believe a change occurred with mom. Perhaps due to a change of scenery, a warmer and sunnier climate, or just a new beginning, but she became more cheerful. She still did not develop any close friendships, but did develop a rapport with the neighbors. She spent hours outside in her garden which she loved when the weather was nice. Although still very much alone she did not appear as lonely as she had in Dayton. 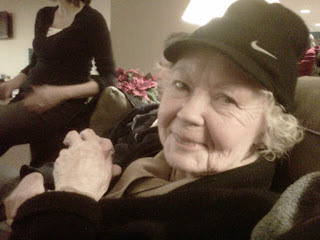 As the Alzheimer's took hold, the last year was bad, but prior to that SC was a blessing for her. The three years with us were wonderful as she lived in our family interacting, giving, and receiving love. Slowly I noticed the walls coming down. In the Memory Support Center I believe she is enjoying the hub bub, the activities, the staff, the residents, basically just the joy of feeling like you belong. She feels safe, secure, and freely gives her affection to others. She frequently is touching, hugging, laughing, smiling, and interacting. Alzheimer's is a terrible disease, however I do believe in Lily's case losing some of those horrible memories has allowed her to blossom back to her original happy and cheerful demeanor in ways she might never have again without developing it. Hidden blessings have definitely emerged. Thinking about this I am sure perhaps the opposite has occurred where the affected person has lost wonderful memories leaving perhaps a bitter unhappy person. That is the thing with Alzheimer's, there are many similarities such as impaired memory and judgment, but the affect on personality and demeanor is different in each case. Perhaps because each person's personality is unique to them. With Lily the losses from the disease allowed other windows and doors to open in ways we could never have predicted.